Nisha Blackwell is the founder of Knotzland, an artisan bowtie company based in Homewood. A selection of bowties made by Nisha Blackwell's Knotzland. Now Blackwell’s company, Knotzland, is shipping out artisan bowties by the dozens and using sustainable material to boot. Hear how the entrepreneur became the founder of Knotzland, and how she’s taking lessons learned to empower others in Homewood to learn more about sewing and owning a business. 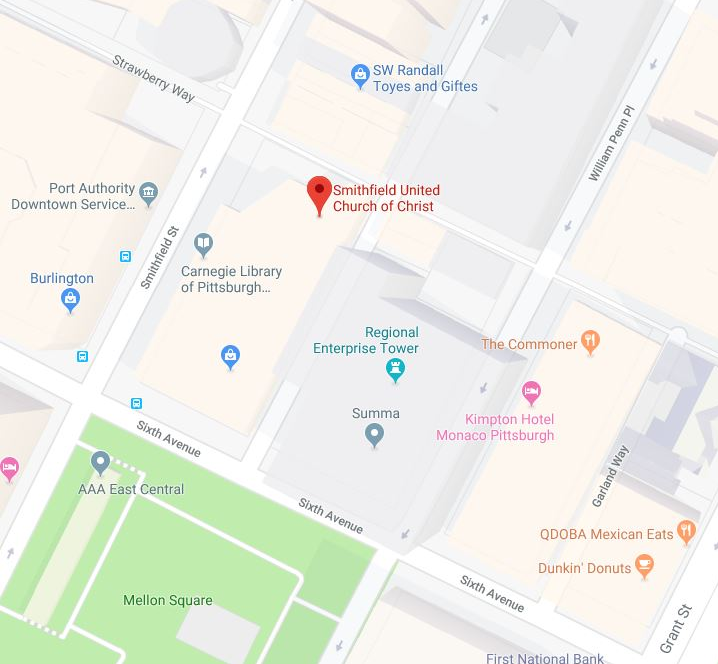 Pittsburgh Mercy's warming center location. Elsewhere in the program, Mayor Bill Peduto promised to stay in line with the Paris climate agreement after President Trump announced the U.S. would no longer be beholden to it. But how realistic are Pittsburgh’s climate goals? 90.5 WESA’s Kathleen Davis reports that reducing emissions is not going to be easy with 80 percent of the city’s greenhouse emissions coming from old buildings. Winter shelters are open across the city, giving people the opportunity to stay somewhere warm for the night. Brian Matous, homeless services supervisor with Pittsburgh Mercy, says workers at the shelters hope to establish a rapport with their clients so they can help them address long-term challenges, in addition to giving them a bed for a night. And grief affects everyone differently, including children. After the mass shooting at Tree of Life Synagogue, members of the Rodef Shalom congregation are coming together to teach adults about how children cope with trauma. WESA’s Sarah Schneider reports that some kids show signs of aggression or become withdrawn, while others process trauma by playing with toys. The event this weekend is free and open to the public. It might seem merely serendipitous that both democracy as we know it and theater as we know it arose in roughly the same place and time: Athens, Greece, in the late 6th century BCE. Pittsburgh Mayor Bill Peduto’s proposed 2019 capital budget could cut funding for the Urban Redevelopment Authority by more than $5 million. URA officials say that limits their ability to invest in neighborhoods.